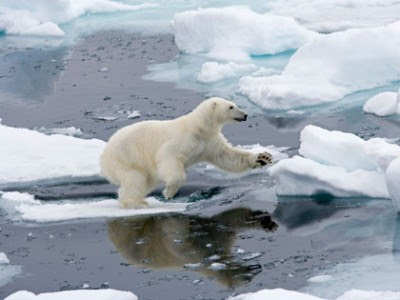 Polar bears are massive in size, measuring from 7-10 ft. long & weighing up to 1200 pounds!The heaviest polar bear on record weighed over 2000 lbs.! Females are about half the size of males, & have gone without food for 4-8 months during their den time. 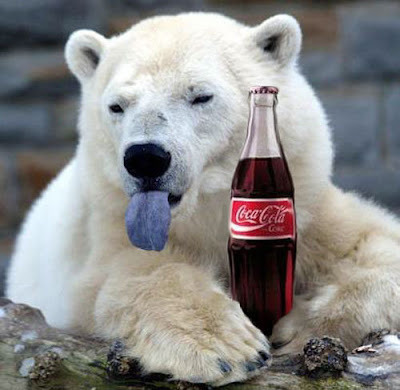 After eating , I like to "Seal" the meal with a Coke". "Things go Better with Coke!" 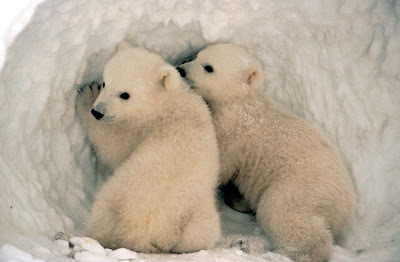 Polar Bears have an incredible sense of smell, able to detect prey up to 2 miles away & buried in over 3 feet of snow. They are equipped with non-retractable claws, which serve as "ice picks", along with little projections on the soles of their feet which serve as suction cups on the ice. It all helps them to "Get a Grip" on the ice. This is really cool, once ewe learn to "Go with the Floe"! 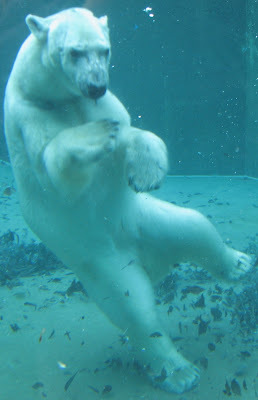 Polar bears have huge forepaws & strong limbs which assist them in hunting & swimming. They are surprisingly fast for their size, able to run up to 25 mph. They are excellent swimmers as well, using their front paws as paddles & their back paws as rudders. They swim as fast as 6mph & also for distances of up to 70 miles! Welcome to my world "Under the Sea", "Under the Sea"! 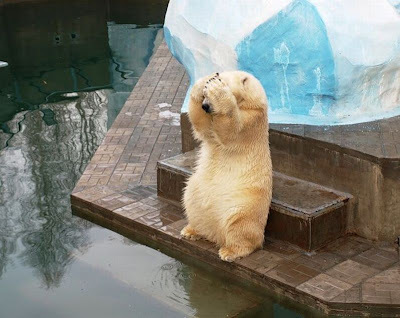 Polar bears live solitary lives, except for mating in the summer. Mothers winter in a den buried in the snow, giving birth to 1-4 cubs , each weighing up to 1.5 lbs. They nurture, feed, & train the cubs for up to 2 years, before they venture out on their own.They do live up to 23 years in zoos. Did ewe know that we cubs have a "Den" Mother? Did ewe know that the skin of a polar bear is black? They have transparent & hollow hair which allows the sun's rays to penetrate deep into the dark skin. This generates heat for the arctic climate. Polar bears also have excellent eyesight & hearing. God has also equipped them with transparent eyelids that serve them in two ways. First, they act as sunglasses, blocking the brightness of the sun & snow, Second, they operate as underwater goggles! 5..4..3..2 ..1 Ready or not, Here I Come! Sheep are not the remarkable predators that Polar Bears are. They have their own unique contribution they make to the world. 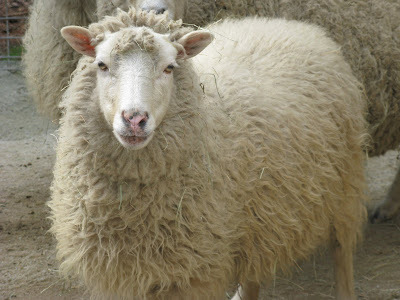 Although they both have sharp senses of smell & hearing, the Bible clearly uses sheep to illustrate the kind of relationship He desires to have with His people. What an honor for them to have Jesus refer to Himself as the Good Shepherd! Jesus was called the Lamb of God! Reflect today on the unique purpose for which Ewe were created. The Good Shepherd has plans for Ewe. Enjoy Ewe-r day with that thought in mind! 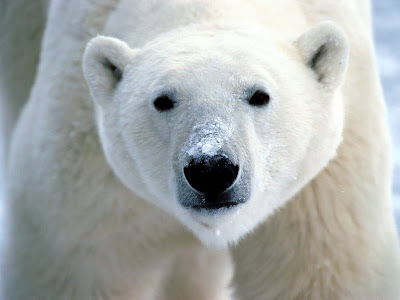 ALSO the HAIRS of a Polar Bear are HOLLOW which helps them to float and swim long distances. But more than anything I'd rather stay a sheep. Thank Ewe For pointing that out, Anonymous! I made the change ! I'm glad Ewe would rather be a Sheep! It's one Baaa...D choice, especially if Ewe don't like the Arctic climate! I hope the Blog continues to encourage Ewe & God Bless Ewe!